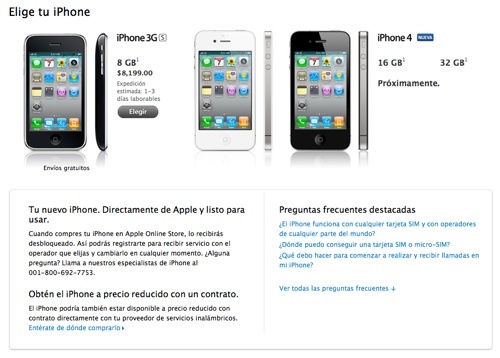 I hope that this is not someones mistake, but as we can see at Apple Store Mexico, the actual iPhone 3G S is unlocked. Mexico is still on the list for next iPhone 4 shipping and for now, nobody knows when they will be available for purchase. I'm shure that it will stay unlocked too. Previous version 3G S 8GB has attractive price of 8,199 Mexican pesos (free shipping, aprox. 650 US$), which for unlocked version is not so bad. For now, you can only purchase this unlocked version at Apple Store, and if you want "lower" price, there is always a contract option. Mexico is not the first country that offers unlocked iPhones, that smart move was already made by several countries, some of them are Italy, UK, France, Australia, Canada, Norway, New Zealand, Switzerland etc (complete list). Because of its size and number of smartphone users, Mexico will get a huge boost with this unlocked options. And I guess that this will “eat” some market that BlackBerry has, at least for GSM providers. One of the most interesting things about this is, no more contracts with Telcel, the leading GSM provider in Mexico, which btw has terrible service, but it’s the biggest and it has the best coverage. Telcel had option of no-contract with prepaid option for almost 900US$, which is too much money, but it was contract free. Now, Apple gave an option for all Mexican cellphone users to not only gave unlocked phone, but also contract and operator free. Until now you could find "unlocked" iPhones on the black market, almost the same way as in the other countries where no unlocked iPhones were available. Many phones were imported from USA, but now, I think that USA people will come more often to Mexico to pickup their unlocked phones :) At least people from southern states. 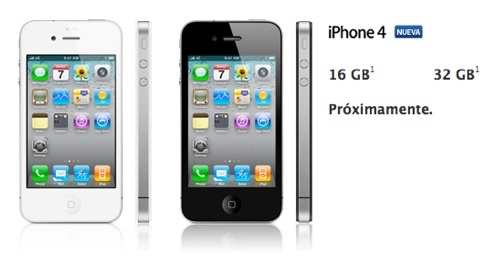 iPhone 4 is now available in 16gb and 32gb versions for 9,799.00 and 11,499.00 Mexican pesos.